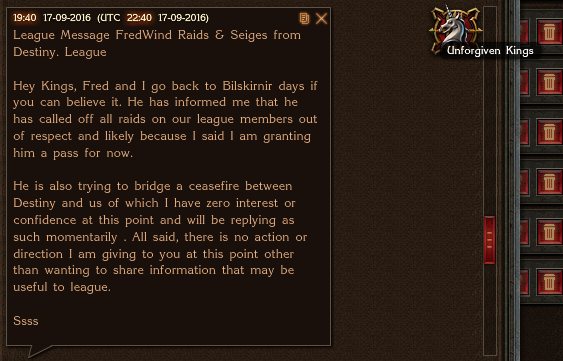 For months, a massive war has been raging across our realm, known best as the "Server Wars". 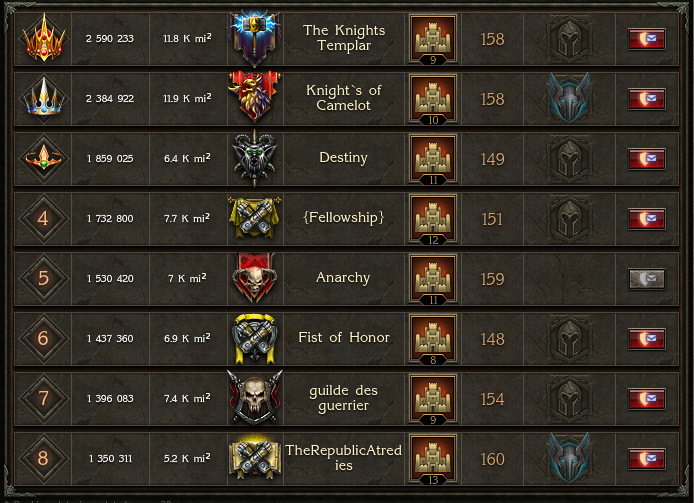 These battles have enveloped most leagues across the realm and have caused untold death and destruction. Yet, a glimmer of hope now shines! This war may be coming to an end. A moment of relief can be had. A deep breath can be taken and you can put down your sword... At least for now. You may have noticed that the fast-paced, violent action seen just weeks ago in the Server Wars has largely died down. The armies have ceased their endless marches and it is safe once again to open your doors and come out of the cellar. The reason for this is because a ceasefire has been called between the Emperors, the Unforgiven and Destiny. The Coralition has also agreed to this ceasefire and for now the endless bloodshed has stopped. As can be seen from the messages above, this has allowed both the Destiny league and the Unforgiven to regain and retake some of their lost beacons. This is great news for both sides, as it once again allows them to access their lands and the much coveted Dark Essence that comes along with it. Strengthening their armies and securing their borders. Although it is just a fraction of what they once held, it is still a step in the right direction. 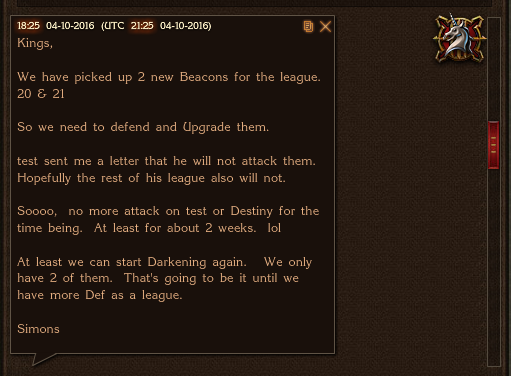 For Destiny, not only have they retaken their valuable edge beacons, but they once again catapulted back up in the ranks, placing themselves in the third position overall in the realm. Sadly, as indicated in the above messages, the ceasefire is for now only temporary, and fighting COULD break out once again at any moment. For this very reason, we urge that no citizen across the realm let their guard down. Be vigilant and stay strong, perhaps this is the end of this gruesome war, perhaps not. Only time will tell, but we can and will continue to hope for the best.